Paula Fleri-Soler takes a look behind the scenes at the set of Spider-Man: Into The Spider-Verse. Miles Morales in Spider-Man: Into The Spider-Verse. More superhero adventures on screen this week with Spider-Man: Into the Spider-Verse as acclaimed film-makers Phil Lord and Christopher Miller bring their unique vision to the Spider-Man story set in a universe that is different from the norm. 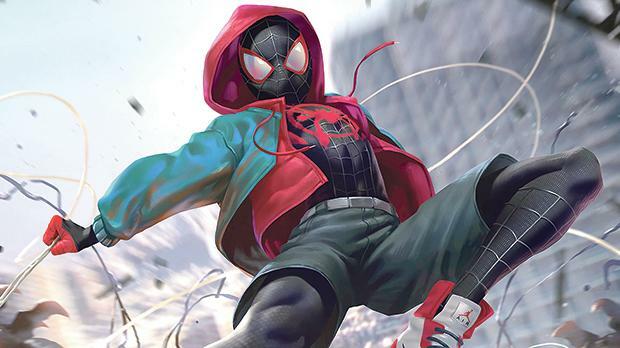 Told in a ground-breaking visual style, Spider-Man: Into the Spider-Verse introduces audiences to Brooklyn teenager Miles Morales, who gets to don the Spider-Man mask. “What drew us to Spider-Verse was the fact that it gave us the opportunity to tell the Spider-Man story in a completely new and revolutionary way for the current generation,” say Lord and Miller. Spider-Man: Into the Spider-Verse brings a completely new take on Marvel’s beloved web-slinging superhero, who was first introduced by recently departed Stan Lee and Steve Ditko in 1962. This latest take on the hero features a diverse cast and a revolutionary approach to the story, and is unlike any of the previous cinematic interpretations of the familiar character. Lord and Miller are best known for directing, among others, Sony Pictures Animation’s hugely popular Cloudy with a Chance of Meatballs and the award- winning The Lego Movie. Miles Morales is one of the characters known as Spider-Man in an alternate Spider-man Universe. The character was created in 2011 by writer Brian Michael Bendis and artist Sara Pichelli. Spider-Man: Into the Spider-Verse features the voices of Shameik Moore as Miles Morales, Jake Johnson, Hailee Steinfeld, Mahershala Ali, Brian Tyree Henry, Lily Tomlin, Luna Lauren Velez, John Mulaney, and Kimiko Glenn, with Nicolas Cage, Kathryn Hahn, and Liev Schreiber. It is directed by Bob Persichetti, Peter Ramsey and Rodney Rothman.